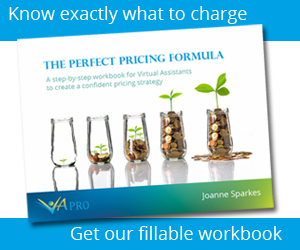 Let’s be honest, one of the most important question when setting up your Virtual Assistant business is how much are you going to charge? But it’s not just a consideration for new VA’s. Veteran VA’s should also address this question on an annual basis. After all, we want to be growing our income year-on-year, just as we would by applying for a pay rise when we were back in the world of the employed. So let’s start with new VA’s – how much should you charge? Google it and you’ll come back with a huge variety of results. Start off with an introductory rate. We’ve all got differing circumstances so there’s not necessarily a one-stop solution. But there are three main options available to consider. A good option for new VA’s. You don’t have to guestimate for projects, and both you and your clients know exactly where they stand. But how do you know what hourly rate to set? Well this is where your skills, experience and niche (if applicable) will come into play. For example, if you’ve had 20 years’ healthcare experience and have decided to stick within that sector targeting healthcare companies, your hourly rate should be the top-end of the scale. You’re experienced, highly skilled and won’t have to be handheld. If, on the other hand, you’re fresh out of college just starting your professional life, you could be incredibly bright and a quick-learner, but you have a very limited skillset and no experience. Your hourly rate should probably be on the lower end of the scale. Initially. What is high-end and low-end? In the UK, Virtual Assistants can come as low as £9 per hour, up to £50+. For specialist VA’s – those who are developers or designers, etc. – often go over that threshold. But on average, UK VA’s earn between £20 and £35 per hour. In the US, the hourly rate starts around $10 and goes anywhere up to $100 – again for those more specialised roles. However, on average it sits around the $25 – $45 per hour rate. The downside to an hourly rate? There only a set number of hours in each day. If you aim to work for 4 hours a day, you’ll only ever earn £100 per day (based on a £25 hourly rate) = £500 per week = £2000 per month = £24,000 per year. Not bad for 4 hours work each day. But still, the only way you can top it is by working more hours. So something to consider before sticking with this method long-term. This can be a good option if you’re used to doing a task over and over, so know exactly how long it will take you. Plus, the better you get at it, the quicker you’ll be, therefore the more money you’ll earn. And from a client perspective, they know how much they’ll be paying regardless of the length of time it takes, so there’ll be no nasty surprises. Always outline the task requirements to the client, along with your quote to ensure both parties know what to expect. Get the client to approve it before starting work. Ensure your T&C’s are up-to-date and include quote information on project related tasks – you may want to include a clause that enables you to go back to the client with a revised quote, once you’ve made a start and the intricacies have become clearer. This is probably the preferred billing method of many established VA’s. It’s guaranteed income, and since the VA is likely going to get better and better at the tasks set, the time it takes reduces while the monthly fee remains the same. Plus, if the hours don’t get used up, it’s generally at the client’s expense. Many VA’s don’t agree to roll the allowance over to the next month. There are a couple of options for a retainer. But why should you reduce your rate for the same level of service? You’re still highly skilled and offering value for money. The client still knows where they stand, they’ve still secured you for X number of hours each month, and you get paid your worth. The downside to a retainer? Having to keep track of the hours spent. This can be time consuming. But hopefully you’ve been efficient in your tasks, that you’ve got a buffer to calculate timings within their monthly allocation. Ultimately that’s down to you. But one thing I’d recommend is to keep it simple. Don’t overcomplicate things by having differing hourly rates, a wide range of packages, and project-based options. At one time or another you may well use all three of the above, which is fine. But remember, the more complicated you make your pricing, the more complicated it will seem to your potential client, the less likely they’ll want to hire you. What if you’re a veteran VA? Review your rates and packages annually. You may not decide to raise them, but it’s worth taking time out to at least consider your options regularly. Hourly rates or monthly retainer?